MY COMPUTER HAS BEEN IN THE REPAIR SHOP FOR A WHILE SO I"M JUST NOW CATCHING UP. Thierry brought his family to Chicago to share in the exciting election evening with Barack Obama. I know I had a great time and I'm sure they did too based on his email below. It was a perfect night. Since the election fully one-third of the hits to this blog have been from France and their former colonies. This is Thierry, the french guy who joined you with Meggie, Julia & Candice on Michigan Avenue on Nov the 4th for the "great day". 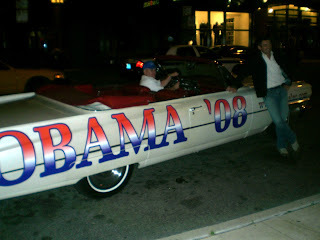 We will always keep a great souvenir of this day and especially of that cruise into the "Obamalac" across the streets of Chicago. We would like to really thank you for having make this moment possible and for your kindness. The girls have realized how lucky they were to be in your car a such historical day and I am sure they will always remember you and this day. The weather, the people, the happyness, everything has contributed to make this day a special day. I also want to say how proud the entire world is for what the people of America have done on that election. We are sure that your choice and your wisdom will bring you some better days.